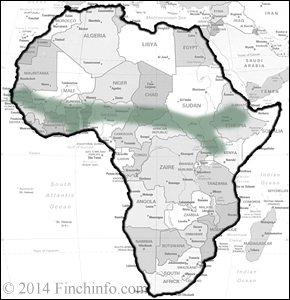 Across central Africa: Senegal, Gambia, Guinea, Ivory Coast, Ghana, Nigeria, Cameroon, Central African Republic Uganda, southern Sudan, Kenya. 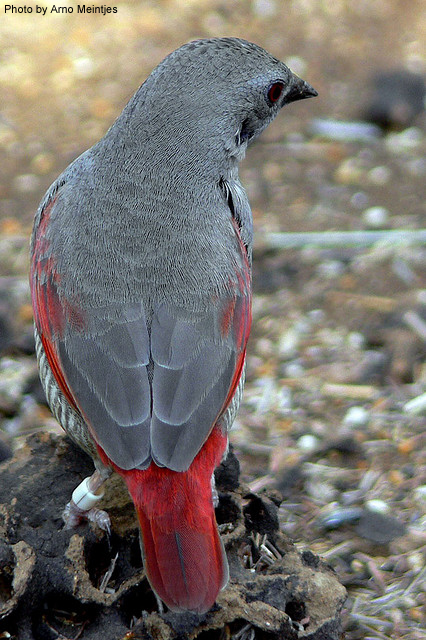 Grey overall with black bill, flesh colored legs, red wing coverts, rump, and tail, fine white barring on underside. Juvenile is brown-grey with pink hue; red areas are sienna, beak is blackish red; underside barring buff and less distinct. A white headed mutation has been reported in New Zealand. The sexes appear similar, but the hen has less intensity to the red areas, has more even/symmetric barring which extends further up the breast, and is paler/more brown overall. May have substantial individual variation. Has been described as a series of rattling notes followed by a croaky whistle, and also described as a melodious fluting strophe. Live food especially termites or ant pupae (very insectivorous), grass seeds, sliced cucumber, green seeds, chickweed. Thickets of thornbushes or bamboo, dry savannas, open acacia woodland, forest edge or clearings, cultivated areas, villages parks and gardens, coastal wetlands. May be spotted in pairs or small groups, sometimes in the company of weavers and other finches. Feeds on the ground, and otherwise prefers to spend its time perched in trees. When alarmed, this bird will freeze in a posture where it crouches and raises its tail vertically. 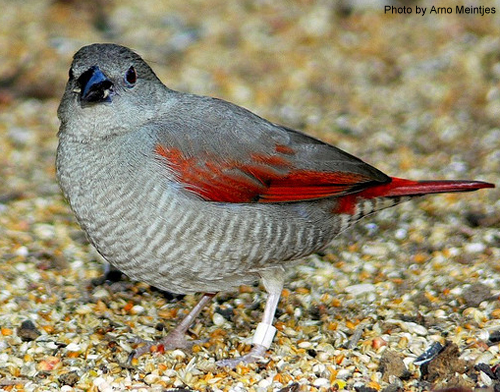 Pairs are monogamous and have solitary nests which both sexes help construct. Nests are untidy and built from grass and lined with feathers, usually in trees 3-6 feet from the ground. A male courts a female by bowing to her while holding straw, singing, and hopping. A receptive female will crouch and quiver her tail. A male will often bring a feather to the nest when relieving a female from incubation duty. Pairs tend to be defensive of their nest. This species serves as a brood host for the Exclamatory Paradise Whydah (Vidua interjecta) and Togo Paradise Whydah (Vidua togoensis). 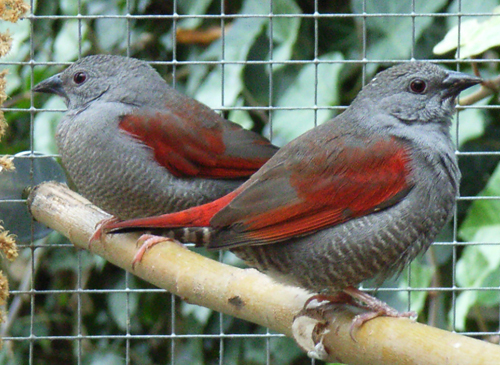 Red-winged pytilias tend to forage on the floor of the enclosure and may be at greater risk for contracting disease if the floor is not well drained. Prone to intestinal parasites and may require frequent (every 3 months) deworming. Egg binding may be a problem, so it is advised not to breed hens younger than 9 months or older than 4 years. May be prone to obesity; maximizing flight space and providing an austerity diet during non-breeding periods is recommended. Cold intolerant; do not house below 54-68°F. Has hybridized with the Red-faced Pytilia (P. hypogrammica) and the Orange-winged Pytilia (P. afra), so take care if housing these species together. At the end of the rainy season. April to November in the UK. 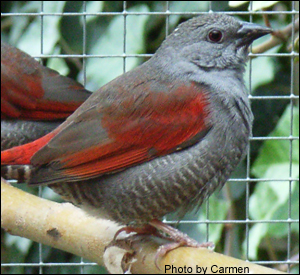 To maximize productivity, red-winged pytilias should be housed one pair per enclosure and fed live food (termites preferred) while breeding. Chicks may be tossed if the supply of live food is inadequate. The breeding diet should be initiated a month before breeding commences. Can be bred in cages, flights, or large well planted aviaries. Will occasionally accept half-open nest boxes or baskets, but typically prefer to build their own nests in shrubbery. Additional nesting sites can be provided by affixing clumps of dried brush to the wall or suspending a wire basket containing dried brush from the ceiling of the enclosure. Provided nest materials should include pliable dried grass, hay, coconut fiber, and small soft white feathers for lining. Nest inspections are not tolerated. Red-winged pytilias will incubate an infertile clutch indefinitely and may need such a clutch removed to stimulate them to try again. Pairs cease brooding chicks at night at 10 days of age, so it is important to make sure the enclosure does not become chilly or the chicks may be lost to exposure. Fledglings may spend their first day or two outside the nest on the aviary floor. Chicks should not be removed from the enclosure until at least 4 weeks after fledging, if at all. If left in the breeding enclosure, older chicks from previous broods may help feed the nestlings of subsequent broods. The old, soiled nest should be removed before the next clutch is started, however, so a fresh one can be built.